While some women are ready to plunge into another pregnancy while they still have one or more children in diapers, others don`t even want to think about seeing the pregnancy test come back positive again until their youngest child hops on the school bus for kindergarten. •How old is your youngest child? If you`re still getting up two or three times a night with a young baby, you might find it hard to find the energy to cope with the physical demands of pregnancy. •How much attention do your other children require? It`s one thing to contemplate another pregnancy if your other children are all relatively self-sufficient; it`s quite another to think about becoming pregnant in the immediate future if you`re busy caring for triplets or a child with complex medical needs. •How does your partner feel about having another baby? While reproductive advances have almost made men obsolete from the reproductive process, most of us prefer to have them along for the ride! If your partner feels quite strongly that he`s not ready for another baby, you might not want to toss the birth control pills in the trash just yet. •Is your relationship on fairly solid ground right now? There`s a myth that says that having a baby can help to bring a couple together when actually the opposite is true. If you`re already having difficulty communicating, having a colicky newborn on hand isn`t going to help matters at all, and you might want to postpone "Operation Pregnancy" for just a little while longer. •How will having another baby affect your family`s financial situation? There`s no denying it: kids cost money. If having another baby is going to stretch your budget to the breaking point, you might want to postpone your pregnancy until your financial situation is looking a little healthier. •How do you feel about having another baby? Does the thought of having another baby fill you with euphoria or dread? 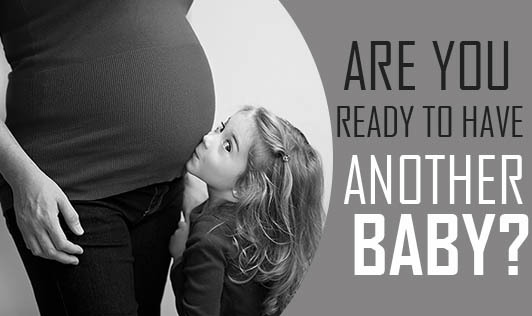 Your gut instinct will tell you a lot about your readiness for another baby. If you take the time to weigh these factors, you should have a pretty good idea about whether or not you`re ready for another baby.